I made it back to a pool session this week for the first time in a few weeks. Work and illness and a birthday got in the way for a couple of weeks, so it’s the first time in a while I’ve done an endurance set. I felt as though I was doing pretty well. I got a bit excited when I was moved out of the slow lane after a few laps, that maybe magically I’d been promoted to the fast lane. Til I recognised swimmers the next lane over and realised we had expanded into 3 lanes and I’d been promoted to the medium lane. Based on my Garmin results (did I mention I’ve upgraded to the 910?) , though my times are pretty dismal at the moment. The whole broken-ankle hiatus, and general slackness in getting back into it on my part have really left me coming into the new season well off my peak form. The geek in me loves the Garmin, but my self-deluding side hates it as there’s no lying to yourself in the face of all that measured data. There are a couple of things that I think might help get me back there, though, so I’m trying not to get too depressed. I had my final physio appointment earlier on Tuesday. I have been cleared for all activities, including starting to jog, even on sand. Guess I no longer have any excuse for skipping the hard part of those ramps sessions. Daylight savings! This changes a lot of things – later opening hours for pools, and opportunities for after-work swims! Spring training timetable changes. 4SEASons October pool sessions will be on Mondays, Tuesdays and Wednesdays from next week, instead of just Tuesdays. My chances of getting back to a minimum of 3 swim sessions a week just got a whole lot better. It’s only a few weeks until the first couple of ocean swims of the season. Nothing motivates like a looming deadline! Let’s hope it doesn’t come to this! So, the other day this happened. Yes, you read that right. Probably the second time as you may have wondered what the hell it was you were looking at. I’m equal parts petrified and excited (hint: a cr@pload of both) about this. I’ve been contemplating it for quite some time, and decided I needed to get in while the limited entries were open before I could back down or change my mind. I’m unbelievably amazed by the fact that this is going to happen (and questioning my sanity in entering the non-wesuit category), and then trying to reassure myself with the fact that it’s not actually that cold (around 15 degrees Celsius) or actually that far (2.4km), It’s just the combination of those things that’s kind of freaking me out. And the jetlag. And the sharks (a myth to scare the prisoners, right?). My recent research Google search suggests that there are sharks in the bay, but not man-eating ones, and that there has never been a recorded attack on a person by a shark there. Whew! So why would i do this to myself? Well, apart from the California holiday I’m planning for myself after the event is done (assuming I survive!) I’m doing it as my goal swim. This year I’ll be mentoring a new long swim program for that brilliant bunch of crazies, Can Too. If you happen to be in a position to join me, you can sign up on the Can Too website now. If you’re not interested in swimming (very hard for me to believe! ), you can still get on board and support my fundraising efforts via my Can Too Fundraising Link. 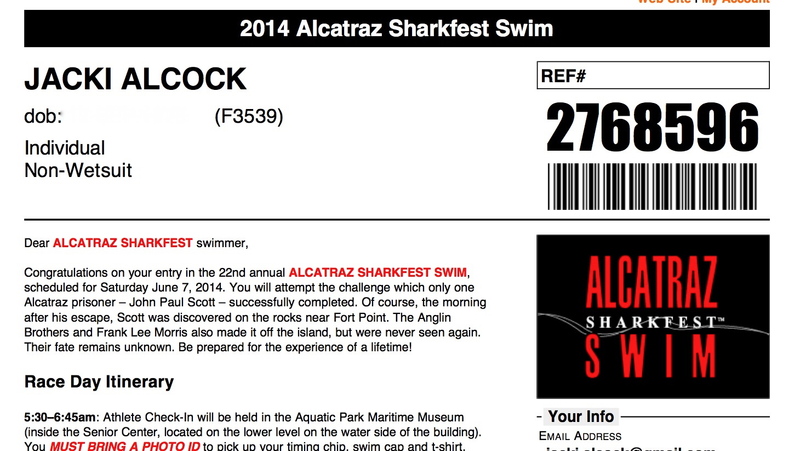 And wish me luck…escaping from Alcatraz! Hey readers, sorry for the radio silence. I’ve been floored with the flu for the past week and haven’t managed to do much of anything at all. In fact the closest I’ve come to swimming is watching Finding Nemo on DVD from under a doonah on my couch. I’m feeling on the mend, today, and hoping to get back to training on Wednesday. In the mean time, here’s someone else’s thrilling open water swimming story. It’s pretty inspirational and includes winning the event…something you’re unlikely to ever read about from me! As I mentioned when I was writing about last Saturday’s training, winter is finally here..and that means the new Icebreaker Challenge! This year the rules have been tweaked a little this year…. The challenge runs from the 1st of June – 31st of August 2013. 1 point – Victoria Park Pool session. Bonus points may be awarded by coaches for any swims deemed difficult or for acts of bravery or craziness. You will qualify as an Icebreaker when you meet 20 points over the three month period of the challenge – and we will celebrate at the end of the challenge. Last year I swam without a wetsuit whenever possible and ended up with loads of points. I wonder if that means I have a reputation to defend? Should I be setting myself a stretch goal? Or is that asking for trouble? Regardless, it should be a good winter with the extra souls in the squad and a new challenge to keep me motivated! If you’ve arrived here without part one of this post, you can read it here. the upshot is that Bel and I were at the pool, down to the wire, to see how we would go swimming 5km in one go as a final deal-maker or -breaker before entering as a duo in the South Head Roughwater. The event has a cutoff – 5 hours.If the team can’t complete the race in that amount of time, they will be recorded as a “DID NOT FINISH”. That’s a long swim to record a “DID NOT FINISH” so, as you can imagine, we really don’t want that to happen. My goal for this pool swim was to complete the distance in under 2 hours…just to give us plenty of wiggle room (plus Bel is quicker than me) to account for conditions on the day. I wore my Timex, which will record up to 50 splits. This had the double advantage of keeping track of how many laps I’d done (I get bad at counting the more tired I get), and collecting the times for each of those laps. And if you know me, you’ll know I love data nearly as much as I love to swim. And my favourite thing to do with data is? Put it in a spreadsheet! Chart it! Analyse it! So that’s what I did. Click on the chart below to get the full view of how the swim went, numbers and commentary (otherwise known as the little voice in my head when I swim) combined. As for the time I swam? 1 hour, 59 minutes and 4 seconds! I did it! Bel and I finished up with a coffee and getting our entry in. Seems it’s all going to actually happen!!!! I’m equal parts excited and scared, but looking forward to the challenge. The bit I haven’t really touched on too much is that this is all for a good cause (other than providing your reading material). If you’d like to support the valiant efforts of Cure Cancer Australia you can help me reach my fundraising goal here. Exactly 2 weeks out from the South Head Roughwater. Crunch time. Since the end of last season I’d been thinking about pushing myself a bit further and the Coogee To Bondi 5km kept popping into my head as the event to do it. By the start of the season I’d decided that I wanted to train for the event, and that’s exactly what I did. Double-up sessions back to back , and keeping focussed on consistently training 5-6 times a week. I was doing pretty well and on track to be ready when in February, 8 weeks out, the website advised the event was postponed with an alternate date to be announces. A bit later this changed to the event being cancelled altogether for the year. After the initial disappointment (eventually) wore off, I put my mind to finding a plan B. There are not many long course ocean swims around, and there was only one that was even as a possibility…doing the South Head Roughwater as a duo. That’s 10km total from Bondi to Watson’s Bay. This, however, presented a couple of challenges. I needed a partner to swim with me. Someone who was a good enough and fit enough swimmer to do the distance, but who wouldn’t be put off by my slower pace. To even enter this event, you need a support boat. It’s in the rules. Fast forward to this weekend. We have our boat and driver (pilot? Captain?) confirmed, but have put off actually taking that step and entering our team. Whilst I’ve done plenty of longer swims and double-ups whenever I’ve raced this season, I actually hadn’t done the full 5km distance and I really wanted to get that under my belt before I could feel really confident that I’d be able to do the event. With that in mind we had talked about doing a 5km pool swim. Initial discussions had involved doing this at the Icebergs pool as it’s ocean water and same temperature as the ocean. Seems our choice of days was poor, though, as it was the launch of the winter season there and they throw ice-block in the pool for a penguin swim! It seems we needed a Plan B to train for our Plan B. Instead we headed to Des Renford Outdoor pool, where we were lucky enough to secure a lane each to ourselves. So how did we go? How did I go? What time did I do? And what was that inner voice up to all that time in the water? Watch this space for part 2 where all your questions (and some you haven’t even thought of yet) will be answered. Finally. Finally! Made it back to a weekday pool training session. It kind of feels like it’s been forever. Funnily enough I did the same thing about the same time last year, for different reasons (tore an intercostal muscle….very difficult to swim with that. Or you know, breathe!) , but I kind of think for me it’s that same end-of-season thing where I’ve been pushing my body and getting up earlier on weekends than I do during the week for work for just long enough that I’m a bit worn out. Sometimes I need to be a bit kind to myself and stop putting quite so much pressure on (even though I still have the big goal swim to worry about) and take a bit of time to restore my energy. The good news is, it worked! I’m feeling great and loving swimming and feeling like I want to do more again, instead of less. It did get me thinking, though, about how much I need to train. The answer is as complicated as the question. I have a couple (or quite a lot) of general rules that work for me…. Three times a week is pretty much a bare minimum. Twice a week…I’ll be going backwards in terms of form and times, but pretty slowly. Once a week is better than nothing, but I will be going backwards nonetheless. 4-6 times a week and I’ll be making good progress and improving. More sessions=more progress. Sometimes other things happen. Guilt trips don’t do me any good. I like to aim for a certain number of training sessions per week, and (provided it’s more than 3) I give myself a “cheat” day I can use if I need for any session. Training has a seasonal aspect to it. I work on different things during the winter than the race season. I probably don’t need to train 6 times a week in winter…and should probably be focussing on different stuff. If I’m hurt or sick…forcing myself to go to training isn’t helping me get better. Appropriate treatment, and recognising the right time to get back to it is key. I’m allowed to forgive myself and move on if I’ve gotten a bit more sidetracked than I’d like. The important thing isn’t worrying about what I’ve missed, but getting on with it, and not feeling too daunted to get back to it. This is supposed to be FUN! I try to remember that. I try to remember, particularly on the tough days, that I pretty much never regret going to training. Being tired is not an excuse…I have more energy after training on a Saturday morning than I ever did the morning after Friday night drinks! All other dodgy excuses go pretty much down that same line of thinking if it really comes down to it. MOST IMPORTANT…training should be a habit not a choice. If there’s no good reason not to go, I go. And I mean a good reason. My mind plays tricks on me and tries to give me crappy excuses all the time. This rule, above all else, gets me there. So ir you’re looking for an upshot, or a pithy conclusion…I’m not sure I have one. Except maybe…”find something you love, and do it as much as makes you happy”. Actually, that’s not bad. I’m going into edit mode an gonna put that in the title. *Swimming helps, but there are definitely no guarantees for my sanity. Not now, not ever. I’d Like to be….Under the Sea…. God, I feel a bit like this blog, and my swimming, and the weather and everything else are all over the place at the moment? The freaking weather. it’s messed with way too many races this season. I haven’t raced in a month, and although a little of that is due to other commitments, the weather this year has been very inconvenient! Mostly on the weekends. It’s messed with a number of races I’ve been entered in. Bondi to Bronte and Bilgola were pretty hard work. Palmy to Whale was the worst I’ve ever seen it. 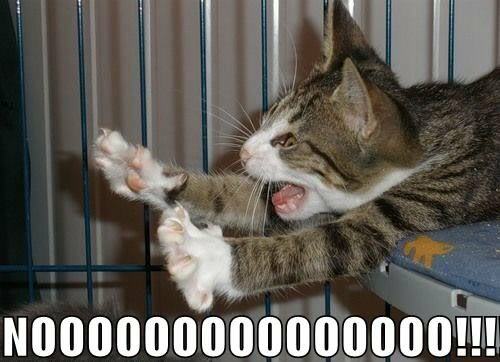 Caves Beach was postponed and the Bondi double postponed til Easter. Freshwater just called things off cos the forecast was too scary and there were no days left free in the season. On top of that….Tamarama to Clovelly (my favourite race last year) told us early on they were going on hiatus for this year. Coogee to Bondi is postponed indefinitely. Coogee to Bondi is postponed indefinitely. I’m still trying to wrap my head around this. Coogee to Bondi is postponed indefinitely. Do they have any idea how long and hard I trained for this event? It’s not all bad news. I’ve been doing my advanced dive training. Pity the freaking weather got in the way so that I had to do it over two weekends instead of one! Work is just mental. One of those big corporate things that I wish didn’t affect my work/life balance but does at the moment. Coogee to Bondi is postponed indefinitely. How bloody hard is it to keep motivated when they take away your goals? Coogee to Bondi is postponed indefinitely. Far out. Not happy, Jan! other stuff going on on the home front…just sold a house I’ve had in Tassie for a million years (or a decade of so. I forget which is longer), and we’re doing some reno work on the place we have here in Sydney, looking to sell up and move into something more aligned with our lifestyles. Negotiations are underway on exactly what that means. I can tell you right now that I am not a contender for the block. I’m OK with doing the work, I’m just really not gonna love it like some people do. Swimming on the other hand…..
Phew, that’s a long list. Embarrassing much? Oh, OK. 5 points were pretty much the same thing. Probably time to move onto plan B, I guess. Watch this space! So, the point is? Besides a bit of self-pity? I’ll be back on track shortly…I always get there. With my little hiatus down South to my hometown I’ll even have a go at getting up to date with the posts. In the meantime, 4SEASons is getting bigger and better so talk amongst yourselves. And if the weather would like to get its shot together…well that’d be just fine too! I came across this article online. It really resonated with how I’ve experienced people react to learning about the sort of swimming I do. Non-swimmers want to know why another human would subject themselves to swimming marathon distances, or in the cold water, or with sharks, or subject themselves to jellyfish stings, currents, and waves. Or why someone would willingly swim at night or without a wetsuit? Why do you do that? Why would you do that? Why you? And many times, swimmers cannot eloquently articulate why they swim in the open water. They know instinctively why, but it is hard to explain their motivations succinctly and clearly to non-swimmers. Tell another marathon swimmer that you are doing the English Channel and they say, “Great! When? Who is your pilot?” They don’t ask why. They instinctively know why. In contrast, tell a non-swimmer that you are going to swim 20 miles in the cold ocean at night with sharks and jellyfish and they ask, “Why?” But even with a reply, non-swimmers remain puzzled. They often continue their inquiry of you, “Aren’t you scared? Worried? Won’t you be tired? Cold? Stung? Eaten?” In general, the risk-oriented response from non-swimmers is completely different from the approach of encouragement, support and wonder from swimmers. Instead of facing questions of why, swimmers face statements grounded in optimism from other swimmers whether the planned swim is 1 mile or 20. I loved this. There’s a great video on there looking at the more philosophical general concept of “why”, but this article inspired me to think about why I do this sport. I’ve gone into detail about the how and what the process was of finding myself in this sport, so here’s a list of my top 10 reasons why I do this crazy thing. Ocean swimmers are nice people. Most people get into it through charity events or programs, and it just doesn’t be the sort of activity that attracts dickheads! I keep surprising myself with what I can ask of my body and have it actually do. It’s different every single time you go out there. My attention span isn’t always that good, especially for exercise, and yet I’ve been doing this for 2 and a half years now without a break and I love it more than ever. Swimming is very meditative. Whether I’m pushing myself for a particular pace in the pool, focussing on a particular part of my technique in a drill, or fighting my way through big surf, swimming is an activity that is by nature very “in the moment”. You really can’t be stressing about the bills or that unfinished piece of work on your desk when you need to concentrate on fundamentals. Like breathing. And not drowning. As far as exercise goes, one where I don’t have to be hot and sweaty the whole time works pretty well for me. It keeps me out of the pub. (Most of the time.) I can’t imagine being in surf with a hangover and wold never do it to myself. Since I like swimming more than I like drinking, it’s a pretty simple choice, and one that makes me feel good and doubles the health benefits of the activity. I feel brave and strong and capable out there. I do something regularly that makes most people at least a little nervous. I feel a little smug sometimes. Especially in winter and in horrid weather. I don’t back down or hit snooze on the alarm clock. I get up and go to the beach and give it a go. I’ve pretty much never wished I’d stayed in bed, and some of those days have actually turned out to be the most fun and memorable. There are some pretty amazing things to see out there. A whole world under the water…rays and fish and aquatic plants and rock formations. Even just the light dappling the sand moving around with the water, and the breaking of the waves above you. It’s beautiful. I just love being in the water. It feels amazing…the weightlessness, the buoyancy, the gliding and the diving. It’s just a little bit like magic. You know, in case you were wondering.